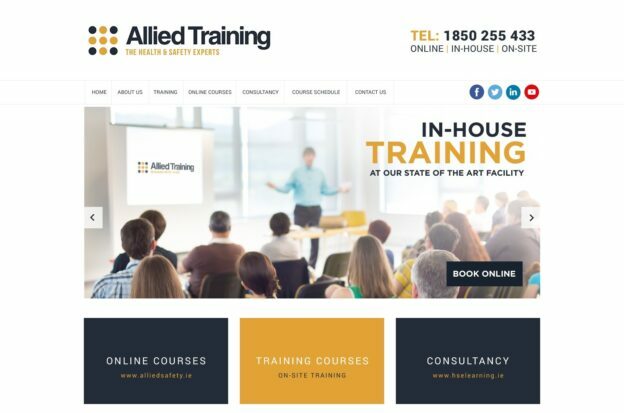 We worked with Terry in Allied Training on developing a brand new website to help promote the range of health and safety training courses Allied Training provide throughout Ireland. They needed a new website to make it easier to get more information about the variety of courses offered. Allied Training has a highly experienced team of tutoring and consultancy staff with a proven track record of success in their chosen fields. With impressive classroom and warehouse training facilities, they offer both centre based and off site training nationwide with a flexible and practical approach to course scheduling and delivery allowing Allied Training to tailor training programmes to suit the needs of learners. Allied Training’s aim is to provide training programmes in the Health & Safety sector, which are of high quality at an affordable price. Check out Allied Training’s upcoming training courses here. This entry was posted on February 11, 2017 by admin.